an evening with the Gillettes. Sir Arthur Conan Doyle created Sherlock Holmes. But, he was brought to life by William Gillette. 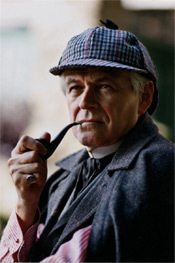 Gillette also put together the "costume," the hat, pipe, lens and cape, that we associate with Holmes to this day. Not only do Harold and Theodora Niver talk about William and Helen Gillette, they become the Gillettes. Flitting back and forth between being presenters and portrayers. “Mr. and Mrs. Harold Niver do not simply appear costumed as the Gillettes, they seem to embody these vanished actors. The depth of their research into the career and life of the distinguished actor/playwright allows them to speak easily and confidently in their roles. They need no script but can simply move among us never stepping out of character. 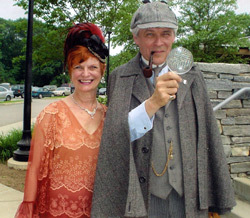 You will feel you are in the presence of William Gillette and his beloved bride."